For each style of fence, the rails may be placed at different heights. 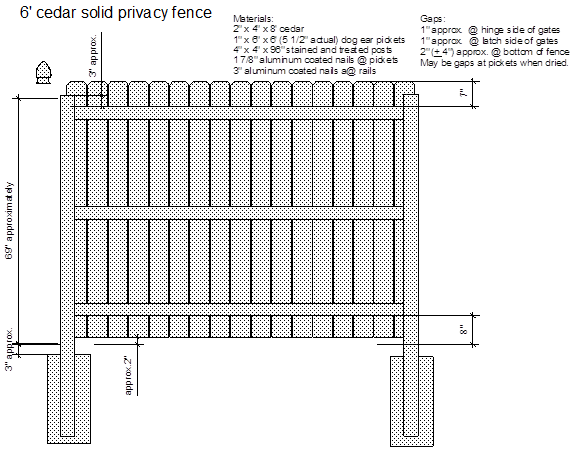 Once you verify the style of fence that you are building; you will be able to determine the location of the rails. Typically, the top rail is placed 7-8” from the top of the fence. The bottom rail is typically 7-8” from the grade. And the middle rail is placed even between the top and bottom rails. Do not place your rails any further from either the top or bottom of the fence. Though cedar is less likely to bow than treated or pine materials, it will still bow if not held firmly in place. Only once the concrete has hardened around the posts, we are ready to rail our wood fence. Though the steps stated below are mostly generic to all wood fencing, there are some individual differences that will be discussed later. Lay your rails out three per bay for six foot fencing and two per bay for four foot fencing. Mark your post with a crayon at top of rail for each rail. With your posts set at 7’ 10” center to center, start railing your fence at one end of the project, setting the first rail flush to the edge of the post. The rails are installed to the outside of the fence toward the public or neighbor’s side. This is important as it applies to some strict building codes that require the good side facing out. As the rail extends to the next post, cut the rail at the center of the post. Repeat this for all three rails. Then, start with another rail butted firmly against the installed rail. Again, cut the rail at the center of the next post. 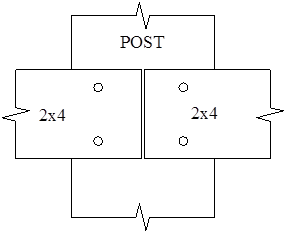 In other words, the rails should always be joined at the center of the post. Use your circular saw to cut the rails. Be sure that the depth is set correctly, avoiding cutting into the post. Where the rail covers the post, install two sixteen penny nails at each end of the rail into the post. To avoid splitting, make sure that you do not get too close to the end of the rail or next to a knot. Repeat this installation throughout the fence line. When finished the rails should flow with the grade. © 2018 The American Fence Company. All rights reserved. Permission granted to reproduce for personal and educational use only. Commercial use, copying or distribution is prohibited without express written permission from The American Fence Company. © 2019 The American Fence Company. All rights reserved. Permission granted to reproduce for personal and educational use only. Commercial use, copying or distribution is prohibited without express written permission from The American Fence Company.